Tendo City is responsible for the production of 95% of Shogi (Chess) pieces made in Japan. 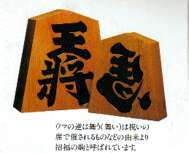 At present, Tendo Shogi Sets are even being used by professional Shogi players, in official Shogi Matches. In 1996, the Ministry of International Trade and Industry declared that Tendo Shogi pieces are traditional handicrafts, so many famous Shogi pieces have been produced in Tendo. In addition to the Shogi sets produced, many large pieces are also made which are used for display. One example is the special Shogi piece with the Chinese character for a horse. This is a symbol of good luck.. Many variations of the 5-sided Shogi piece can be seen as you wander the streets of Tendo in store signs, street signs and the like. Shogi is a game similar to Chess. Both Shogi and Chess originated in ancient India. 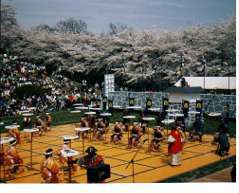 From India, Chess spread throughout Europe and Shogi came east to China, Korea and Thailand. It then came to Japan where it has maintained its popularity until the present day.